Over recent years, social media engagement has proliferated among physicians, health care systems, scientific journals, professional societies, and patients. In radiology, Twitter (Twitter Inc, San Francisco, California) has rapidly become the preferred social media engagement tool and is now an essential activity at many large radiology society meetings. Twitter offers a versatile, albeit simple, platform for anyone interested in engaging with others, regardless of title, stature, or geography. In radiology and other medical specialties, year-after-year increases in Twitter engagement before, during, and after professional society meetings continue with widespread positive feedback. This short-form messaging tool also allows users to connect and interact with high-impact individuals and organizations on an ongoing basis (rather than once a year during large meetings). Through live-polling, Twitter also has the power to gather global opinions on issues highly relevant to radiology's future, such as the Medicare Access and CHIP Reauthorization Act of 2015 (MACRA) or breast cancer screening. Also increasingly popular is "live-tweeting" of curated meeting content, which makes information from the meeting accessible to a global audience. 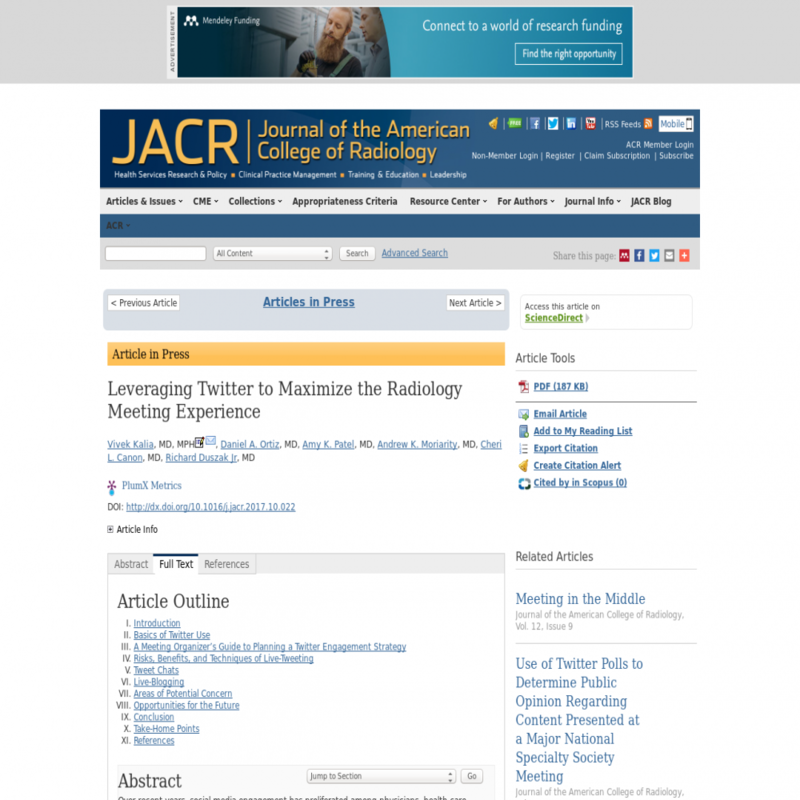 Despite the promise of growing professional networks and enabling discussions that cross geographic boundaries, the risks of Twitter use during radiology meetings must be recognized and mitigated. These include posting of unpublished data without consent (eg, slide content captured on camera phones), propagation of misinformation, and copyright infringement. Despite these issues and with an eye towards professionalism, Twitter can nonetheless be used effectively to increase engagement among radiologists, radiology societies, and patients.